The approach to force development in Tai Chi Chuan is internal, with the emphasis on mind power and intrinsic energy flow. Thus, if you practise Tai Chi Chuan, your force training does not require you to hit sandbags, lift dumb-bells, jab your fingers into granules, strike your shins against poles, or do any of the tough and painful conditioning that leaves calluses on your hands and feet. Yet the force developed, if you know how to make use of cosmic energy, is greater than all the sandbags and dumb-bells put together. In external force training, the force developed is usually localised and specific. For example, if you strike your palms against sandbags or kick your shins against poles in your training, the force you will develop will be localised at your palms and shins. Its use is also usually specific – having powerful palm strikes and shin kicks. 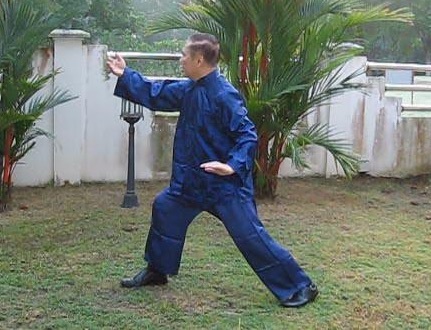 But in the internal force training of Tai Chi Chuan, the force developed is usually versatile and capable of varied uses. If you enhance your mind power through meditation and your intrinsic energy through chi kung practice, you can not only develop a clear mind to observe your opponent’s moves calmly and be able to channel you intrinsic energy to your palms or legs for powerful strikes, but also increase your mental focus and clarity of thought, as well as facilitating harmonious energy flow for better physical and emotional health. Moreover, you also have the advantage of convenience: if you adopt internal force training, you need not worry about carrying your sandbags and dumb-bells with you whenever you travel. Numerous methods of internal force training will be described later. Many people believe that in Judo brute strength is not necessarily a winning factor. A classic illustration of Judo shows s small girl using a little finger to push a gigantic sumo wrestler, who is already off balance, to fall backwards. In real life, however, a sumo wrestler is unlikely to be caught off balance in such a position. Even if he were, all he, or anybody else for that matter, would have to do to save himself would be to take a step backwards to regain balance. The truth is that it needs a lot of strength, in Judo or any other art, to throw even an ordinary person down – unless that person is naive enough to be caught in a falling position. Tai Chi Chuan rather than in Judo is the art that best demonstrates that brute strength is not necessary in fighting. A fragile-looking girl who is expert in Tai Chi Chuan can not only effectively defend herself against a strong man, but also cause him serious injury, including pushing him onto the ground. She still needs a lot of strength, but not necessarily of the brute or mechanical kind.